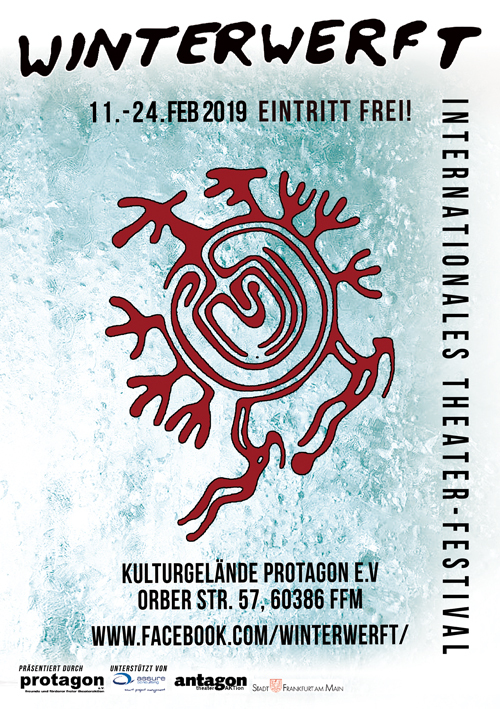 We are delighted to have been invited to take part in the Winterwerft theatre festival in Franfurt next month. On 16th and 17th February Charlotte Du Cann and Dougie Strang will be presenting a double bill of performance/workshops and a ‘conversation in the dark’, based on their dramaturgical work with Dark Mountain and the Kairos Collective. The Red Thread follows the ancient Cretan story of Ariadne and the Labyrinth, piecing together the shards of a more potent myth. What lies underneath this prison? Who is the Minotaur? How can the embodiment of this mystery help us deconstruct the maze of our own civilisation and liberate our future selves? Part performance, part presentation, part interactive storytelling, this session explores how we might step into the labyrinth to discover a way out of our present predicament. A Dance Called the Anthropocene is an immersive theatre experience. It’s an exploration through movement and sound of our attitudes towards ecological crisis. Together we will consider what it feels like, in our bodies, to be in denial, to be angry; to wish for solutions or despair at the lack of them. Together we’ll find a way to dance in the Anthropocene. DISCUSSION : Conversation at the End of the World (As We Know It) The Dark Mountain Project invites you to take part in a conversation about what happens when we stop pretending everything is fine and start to question the stories we live by. When everything is unravelling, what are those stories that still have meaning and value? What matters to us, in our own lives, and what truths might we share if we knew the world were ending? Dance, performance, storytelling and poetry, art, music and science – with dirt under our fingernails and bird nests in our hair. Winterwerft is a place for theatre that looks critically and creatively into the darkness of these times. We want to sit down together and look at how we can change perspectives and ways of walking through the world, exploring what stories can inspire, carry us in the future and give us hope. The fire has always brought people together, and around the fire people have always searched for meaning (as well as played with nonsense).. Our fire is the theatre stage, where we gather and search for meaning and absurdity in times of severe ecological and cultural crises. Theatre, Dance and Performance, Stories and Poems, Workshops, Music, Babushka Café, Labyrinth and Yurt. NOTE: ‘A Dance Down the Dark Mountain’ will also take place at this year’s Unfix Festival in Glasgow on 30th/31st March.